Festus Keyamo, spokesman of the reelection campaign of President Muhammadu Buhari, has asked Nigerians not to join ex-President Olusegun Obasanjo in receiving the curse he allegedly invoked on himself, over former Vice-President Atiku Abubakar. However, on Thursday, Obasanjo endorsed his former deputy ahead of next year’s presidential election, after he asked for his forgiveness. 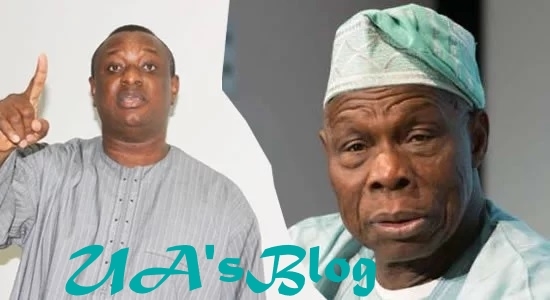 Keyamo wondered why Atiku chose to beg Obasanjo, rather than present evidence that he is not guilty of the allegations levelled against him. “However, we are bemused and amused that a character who intends to be President of Nigeria has, for the past eleven years, consistently begged for “forgiveness” from a man who has consistently and unequivocally called him a very corrupt fellow. “In 2014/2015, President Muhammadu Buhari and his team, out of respect and convention, paid courtesy calls on prominent individuals and statesmen in the course of their campaigns when they visited cities in which these individuals lived. However, Nigerians should note that President Buhari was NEVER reported to have groveled and “begged” ANYONE for forgiveness, just to be endorsed as a Presidential candidate. Ultimately, he relied on the people of Nigeria to decide his fate. President Buhari would continue to rely on the endorsement of the people of Nigeria to be re-elected,” he added. Keyamo also tackled David Oyedepo, founder of Living Faith Tabernacle, Mathew Kukah, Catholic bishop of Sokoto diocese; and Ahmad Gumi, Kaduna-based Islamic cleric, for accompanying Abubakar to Obasanjo. “We are glad that they have publicly declared their partisan interest and urge all Nigerians to see all their previous, present and future attacks on President Buhari from their pulpits in the context of partisan politics and not in the context of nationalistic or altruistic commitment. We wish them well,” he said.